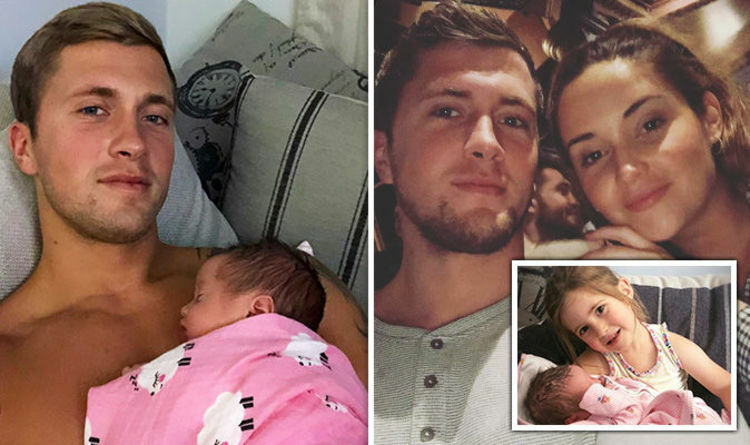 Jacqueline Jossa welcomed her second child with Dan Osborne, who is also father to four-year-old Teddy from a previous relationship, yesterday. Following the happy news, Dan treated his 901,000 Instagram followers to a series of snaps of the newborn. In one capture, the couple’s eldest daughter Ella, could be seen sitting on a sofa as she held the tot. The three-year-old grinned as she gazed at the camera. Beside the adorable snap, he wrote: “2/3 of my ABSOLUTE WORLD!! Welcome to the world Mia Osborne, another little princess. In another upload, the 26-year-old could be seen cradling the little bundle of joy solo. Overjoyed to finally be able to hold the newborn, the Essex-based hunk smiled softly as the little one slept on his chest. “We chillingggg. I feel truly blessed! She is just perfect #skintoskin #daddysgirl,”(sic) he penned. However, Dan was forced to hit back at one Instagram user, who recommended that Dan didn’t “mess this up” and “break their hearts again”. Responding to the remark, the former The Only Way Is Essex star wrote: “I will always be the best dad they could ever wish for thanks. The former EastEnders actress also confirmed the happy news about the tot on her own Instagram account, as she shared a snap with her 1.3 million followers. Beside a photo of Ella holding the baby, the 25-year-old penned: “My little family is complete! Mia Osborne is so beautiful! She continued: “Me and baby are healthy and resting now. Welcome to the world baby girl! Jacqueline and Dan, who had their first wedding anniversary earlier this week, hit the headlines last month after the duo admitted to struggles. The shock separation emerged after it was revealed the TV personality was staying at a friend’s house. However, the TV star recently moved back into their family home in order to help with the new arrival. Speaking about their relationship during a recent interview with OK! magazine, she said: “We’ve been through a rough period but right now we’re getting on well.